Valkyria Chronicles is one of the most unique and fun strategy games Ive ever played, despite a few flaws with the port. What is it? A JRPG strategy game set in an alternate reality World War 2. Reviewed on: Windows 7, Intel i7-4960x, 32GB RAM, Nvidia GTX Titan. Play it on: Windows 7, Intel Core2 Duo @ 2.8GHz, 3GB RAM, Nvidia GTX280+, a toaster could probably run this game well. 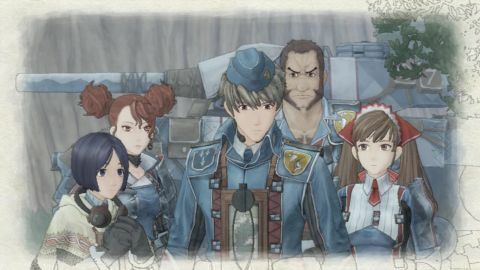 I hadn’t heard Valkyria Chronicles' familiar violin melody since Sega first released it for PS3 in 2008, but six years later, those strings whisked me back to Gallia and the familiar faces of Squad 7 with an instant hit of nostalgia. With a recent rash of Japanese games being ported to PC in a less-than-ideal manner, however, and a PC Valkyria Chronicles going from rumor to announced to released in less than three weeks, I was nervous it wouldn’t be anything more than a quick port. I'm happy to report that my delight with the PC version didn’t stop at the violins. Valkyria Chronicles is a turn-based strategy, third-person real-time shooter, alternate-reality World War II JRPG, and miraculously that all comes together beautifully. Confused? It breaks down like this: You command a series of turn-based battles from the perspective of a top-down map, and are given a fixed number of command points per turn. However, when you use command point to select a unit, the camera zooms in to put you in an over the shoulder perspective. (See a GIF of it in action here.) Your movement and weaponry is limited based on that unit’s class—Scout, Shocktrooper, Lancer, Engineer, or Sniper—and enemies will shoot at you if you get too close. When you aim, enemies stop attacking and you are shown a circle cross-hair to line up, representing that unit’s accuracy—but you only get one shot each time you select a unit, so a miss can be devastating to a strategy with no backup plan. When you are out of command points the enemy takes their turn, so positioning is incredibly important. This unique combat system forced me to learn strategies on a few different levels. The map view makes me feel like a commander, having to constantly think of the big picture, while zooming into a soldier is a completely different, more personal experience. Whenever I make a wrong move and a unit is shot down, I'm always hit by the same reaction: anger over my mistake, then concern that I won't be able to rescue the unit. The possibility of permadeath for all but the story characters means that if a downed character can’t be reached in three turns, they are gone for good. But as the map zooms out, my sympathy fades and I start thinking about how my squad will need to adjust for the loss. Through all this, every victory and defeat feels like my own. The importance of my personal choices, not just on the battlefield, became even more apparent towards the second half of the 30-40 hour story. The missions ramp up in difficulty and a variety of different weapon choices open up. Each unit, who already differed in both their strengths and personalities, can now be diversified even further to fit niche roles in my squad. Deciding what class to upgrade and which weapons to research means it’s no longer just a game about positioning. Though battles can be played slowly and safely to ease the difficulty, the rewards I got for pushing the limits of my squad were worth it, and my connection and love for the specific characters grew stronger each time they made me proud. Each battle usually required about nine units, but my squad has 20 to choose from, all of which—except three story characters—I picked from a pool of at least 40. Every unit has their own personality, including fully-voiced dialogue, characters they prefer to work with (with whom they have more unique dialogue), and a full page of back story that is only revealed as they fight. The amount of detail and choice is staggering. I grew very attached to my favorite soldiers, cut people from my squad based purely on their attitude, and am still astounded that a character sitting in my barracks unused has the same level of depth, whether or not I'll see it. Though its set in an alternate reality, Valkyria Chronicles doesn’t shy from the real-life horrors of its World War II inspiration, addressing issues that Western WWII games don’t even like to discuss. One mission tasks you with liberating a concentration camp filled with Darcsens, this world’s persecuted people. The story can be over dramatic and heavy-handed at times in a uniquely JRPG sort of way—you can switch to the Japanese voice actors and use subtitles if you are off put by the sometimes flat English voice acting—but I was legitimately invested in not just the lives of the characters, but the story of Gallia, the country I was protecting. It’s melodramatic, but heartbreakingly real at times—depicting war in the style of a documentary rather than a Hollywood blockbuster. The campaign is presented in a book format—each new chapter being some significant moment of the war—alternating between long cutscenes and dialogue segments, and battles that sometimes take an hour and a half. The cutscenes lose a lot of their charm due to their fixed resolution, making them look downright terrible on my 1440p monitor, however the gameplay and dialogue segments were nearly flawless. Valkyria Chronicles doesn’t have a resolution or framerate cap and has fully customizable controls. The only issue that negatively affected gameplay was the finicky tank controls, which would move unexpectedly whenever I adjusted the camera and made the already hard-to-control tank units even more of an issue. Outside of that, I used mouse and keyboard controls for most of the game, and found them better than the gamepad controls. Durante wrote a fantastic in-depth piece about the quality of the Valkyria Chronicles port, but overall Sega made sure the must-have features were included even if it didn’t go the extra mile. Valkyria Chronicles was an incredibly unique game when it was first released, and six years later I still haven’t found an experience quite like it. Apart from the cutscene resolution, its beautiful watercolor style and challenging gameplay haven’t aged a day. Yet it’s now bundled with all of its DLC for only $20/£15; a fantastic value for strategy fans and PC gamers who didn’t get a chance to play it the first time around. While the port quality might not win any awards, it does the game justice and brings Valkyria Chronicles to a platform where it can shine with other strategy game elite.